Domenico Scala is set to chair Fifa's reform taskforce after meeting three confederation presidents, including Uefa's Michel Platini. 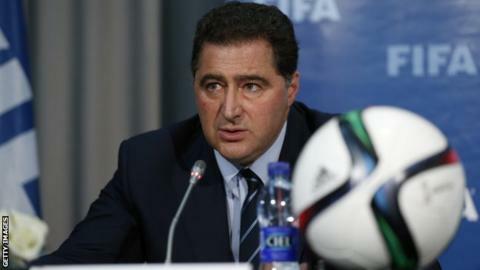 Scala has been leading the governing body of world football's latest attempt to reform itself since Sepp Blatter said he would stand aside. The taskforce has been asked to report its findings within seven weeks. But campaign group New Fifa Now told the BBC: "The notion that Mr Scala is independent is laughable." New Fifa Now is backing Fifa sponsor Coca-Cola's campaign for a wholly independent process backed by experts and an 'eminent' chairperson to take a wider look at how the governing body can change. Jaimie Fuller of New Fifa Now added: "The cynical attempts to portray this ridiculous plan as having any semblance of independence should not be a surprise to anyone after the litany of previous efforts to pull the wool over everyone's eyes. "If Mr Blatter and Fifa are allowed to get away with this it will be a huge travesty of justice. "We have been calling for an independent reform commission made up of truly independent experts in the field of worlds best practice governance and transparency, led by an eminent person such as Kofi Annan." That call has been echoed by former Fifa presidential candidate Prince Ali Bin Al Hussein of Jordan. Prince Ali, who unsuccessfully stood against Blatter in May's presidential election, issued a statement calling for "a totally independent body, not from within the governance structure of Fifa". He added the reform process was being "rushed through without any consultation", and was also critical of the seven week timeframe, saying: "There can be no quick fix to issues that are clearly structural." The BBC has learned that Scala met three of the six regional confederation presidents over the past 48 hours. It is thought Platini would not oppose Scala as chairman but it is understood his first choice would be a candidate from outside football to lead the taskforce. Scala, the independent head of Fifa's audit and compliance committee, is also believed to have the support of the other three regional confederation presidents, although they have not met him in person. He is now thought to be considering whether or not to accept the role, with a decision expected within the next few days. The taskforce will be made up of 11 people and will be asked to look at how it can reform football's scandal-hit world governing body. Fifa stated on Monday that the group would be led "by a neutral chairman" and "should be appointed in consultation with the confederations' presidents". It will be composed of two representatives from the AFC (Asia), CAF (Africa), Concacaf (North, Central America and the Caribbean) and Uefa (Europe), as well as of one representative from each of Conmebol (South America) and the OFC (Oceania). The recommendations resulting from the talks are due to be presented at the next meeting of Fifa's executive committee in Zurich on 24 and 25 September. Any proposals would need final approval from the 209 members associations at an emergency congress next February. Specific topics under discussion by the taskforce will include term limits for presidents and executives. Integrity checks for top officials and transparency over salaries will also be on the agenda. On Monday, Sepp Blatter said the set-up of the committee would be like "10 players and a coach" with one key person - the "coach" - driving the process. Blatter is determined to reform Fifa's governance before he steps down as president in February 2016. It's understood that one of Fifa's American lawyers, Jenny Durkan of Quinn Emanuel, urged the organisation's executives on Monday to show they are co-operating with the US Department of Justice criminal inquiry by adopting new regulations. Platini, speaking after the meeting on Monday, said the creation of the panel was "an important step". "We must now make sure that the reforms outlined today will be undertaken in a swift and effective manner. We need to reform Fifa and we need to do it now." Fifa's plans have also been criticised by anti-corruption body Transparency International which believes the taskforce will be ineffective and prove to be "more of the same".